Description A remarkable example of the re-use of a work of art, reflecting the course of Egypt's long history, this statue was originally carved to commemorate a powerful government official. A thousand years later the inscription naming this unknown man was erased, and a carved scene was added depicting its new owner, Pa-di-iset, son of Apy, worshipping the gods Osiris, Horus, and Isis. From a text on the rear of the statue we learn that Pa-di-iset was a diplomatic messenger to the neighboring lands of Canaan and Peleset (Palestine). 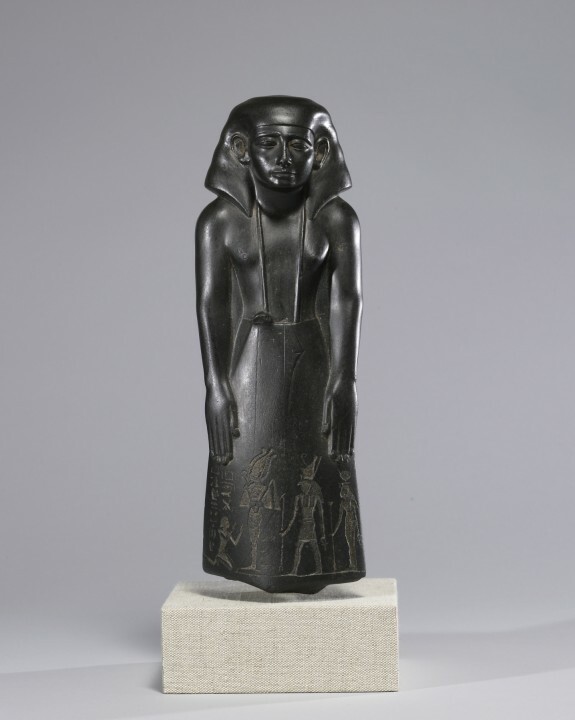 Provenance Maurice Nahman, Cairo; Henry Walters, Baltimore, 1928; Walters Art Museum, 1931, by bequest. Inscriptions [Translation] caption of the scene on the kilt: Ka of Osiris: Pa-di-iset, the justified, son of Apy. [Translation] on the back pillar: The only renowned one, the impartial envoy of Philistine Canaan, Pa-di-iset, son of Apy.